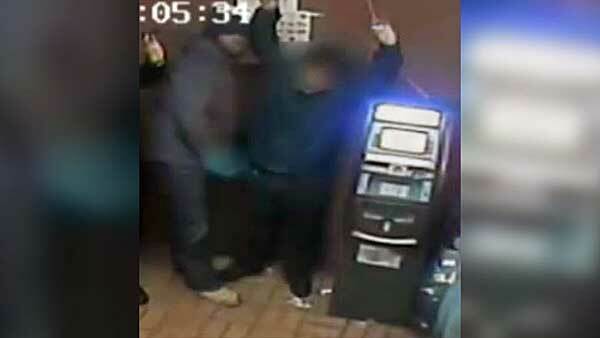 Philadelphia police are searching for 4 suspects who robbed a man at gunpoint in the city's Kensington section. KENSINGTON (WPVI) -- Philadelphia police are searching for 4 suspects who robbed a man at gunpoint in the city's Kensington section. It happened on October 3 on the 300 block of East Cambria Street. Surveillance video shows the 4 suspects approaching the man from behind inside a restaurant around 1:15 a m.
The 31-year-old victim can be seen putting his hands in the air as the suspects point a gun at him. They went through the man's pockets and stole his wallet, Access card, almost $100 cash and an LG cellphone. The 4 thieves then fled on foot in an unknown direction. Police describe the first suspect as a black male, 5'9" tall, 160 lbs. and 30 years-old with a dark complexion. He was wearing a white puffy coat, and a blue hat. The second suspect is described as a black male, 5'10" tall, 250 lbs. with a dark complexion. He was wearing a blue coat, and a blue hat. The third and fourth suspects are described as black males wearing all dark clothing. Anyone with information is asked to call police at 215.686.TIPS (8477) or text a tip to PPD TIP (773847).